On the high street, right in the centre of Morzine, just 100m to the nearest ski lift and 300m to the piste and nursery slopes. Ski hire is provided by Doorstep Skis who offer an in chalet fit service. What's the hardest thing in the world to find when four of you like to ski and want service and a bit of privacy? 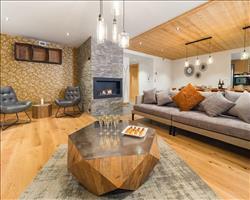 Probably a two-bedroom catered chalet-apartment bang in the centre of a leading ski resort, Morzine. This bijou gem boasts flat screen TV, comfy sofas and a delightful heated terrace over the high street to soak up the Morzine vibe. This is a canny skier's hideout in an incredible location with en suite bedrooms and balconies to the rear. 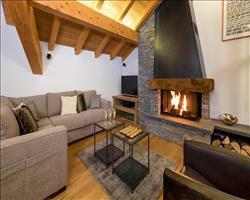 The apartment is entirely independent with its own living and dining area and a dedicated chalet host. If asked for a quote we'd say ‘remarkable location with a dash of our signature urban chic'. Call soon, apartments for four don't stay on the shelf for long. Double with balcony, en suite bath, hand basin and WC. Limited space for a cot. We update Little Lumi's details often, but facilities do change. e.g. some extras listed by the supplier as "free" or included might only be for the first time you use them, or for one time per party, then charged for further use. If any specific feature is essential to your holiday, make sure you ask us to confirm the details of it before you book your holiday. This package holiday to Little Lumi in Morzine, France departs Sunday 15th December 2019, for a 7 night stay on a "catered chalet" board basis. A local tourist tax (Taxe de Sejour or Kurtaxe) is levied by many councils in European ski resorts. It varies by standard and type of accommodation and is age dependent, so not everyone is charged. It's not included in the basic price of your holiday and is usually paid locally. For reference, the average charged in winter 15/16 was between 50p and £2 per person, per night. Morzine ski holidays ooze traditional Savoyard charm. With a variety of terrain in the huge 650km Portes du Soleil area, Morzine is a ski resort that pairs modern snow sports with authentic character. Famous for its' warm welcome to families and groups, traditional wood and slate Morzine chalets nestle snugly into the beautiful Portes du Soleil mountainside. Portes du Soleil (Adult 6 day): €225. Ask for a quote when booking Little Lumi. Morzine has N, S, E, W facing slopes. Chalet Nevada Morzine France, Gatwick to Geneva 15th December. Chalet Kenai Morzine France, Gatwick to Geneva 15th December. 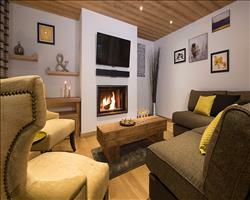 Chalet Kaila Morzine France, Gatwick to Geneva 15th December. Colibri Uno Morzine France, Gatwick to Geneva 15th December. 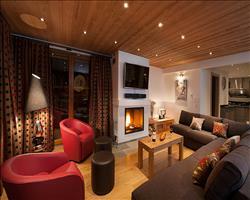 Colibri Penthouse Morzine France, Gatwick to Geneva 15th December. 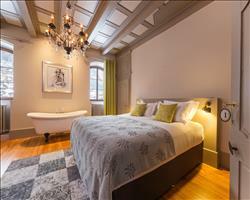 The Manoir Morzine France, Gatwick to Geneva 15th December. Great week away with the family, apartment is perfect for a small family and very well located. Matts food has exceeded our expectations and he’s been a great host. Only suggestion would be to drop the awful armchairs and replace with a second comfy sofa. Regardless of this small point I would definitely recommend to friends. "Little Lumi, little gem, happy days!" A great holiday in morzine. Matt is an excellent chalet host, articulate, engaging and helpful. The chalet is very well equipped and perfect for four. The street can be a little noisy but you are in the Middle of town so fab access to everything. We loved our chalet from the moment we walked in, really cosy and comfortable. The location cannot be improved on, right on the high street in the middle of Morzine… And only a short stroll to the Pleney lift and Super Morzine cable car connecting us to the Avoriaz skiing area. Our chalet host Matt was a great cook and easy to chat to and really helpful with the kids :) we had far too much to eat and drink and were treated like vips!!! The snow conditions were not perfect but completely appropriate for this time of year, we did a lot of skiing on spring snow, and some touring too! Overall a very enjoyable stay, thank you again to the chalet crew, you couldn’t have made it any more relaxed for us. All the best from family Gomersall.